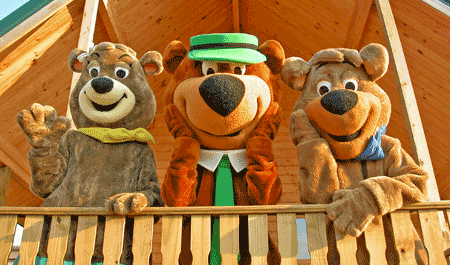 Leisure Systems Inc. (LSI) executes an annual marketing plan with the goal of keeping Yogi Bear’s Jellystone Park™ Camp-Resorts at the top of every camper’s list. There are many ways we get the word out about the system as a whole, and about each park in particular. In addition, we provide tools such as the guest survey, costumes and our Customer Care program to enhance your own marketing programs. The way businesses market themselves has changed drastically over the last few years. It has become more important than ever to have a visible presence online. In addition, as more people access information via mobile devices, businesses must adapt their websites and reservations processes. Are you meeting the needs of today’s modern guest? Let LSI help your campground navigate the ever-changing marketplace. Here are some of the benefits you’ll receive as a Jellystone Park™. Campjellystone.com – Powerful, responsive-designed website that attracts new guests and sends them to your park. 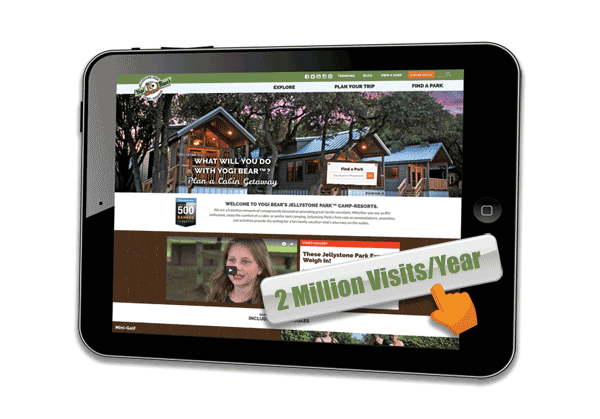 Campjellystone.com receives nearly 2 million visits per year and this number continues to grow. JPKid.com – We know children influence family buying decisions. That’s why we created jpkid.com – to appeal to our young campers with games, activity badges and much more. Social Media – We have a strong social media presence on Facebook (facebook.com/campjellystone), Twitter (twitter.com/campjellystone), YouTube (youtube.com/campjellystonevideos, Instagram (instagram.com/campjellystone) and Pinterest (pinterest.com/campjellystone). We also host an active blog at campjellystone.com/journal. Public Relations – We execute a comprehensive annual PR plan to target national and local media outlets. For new locations, LSI provides individual releases to increase awareness in your local area of your conversion to a Jellystone Park™. Directories – LSI prints and distributes approximately 150,000 directories each year. We fill directory requests that come via website, phone, RV dealers, travel plazas, etc. In addition, we contract with Anderson’s Brochure Distribution for distribution at RV/camping shows. Promotions – Each year, LSI launches promotions for events like Mother’s Day and Father’s Day, plus contests that get families excited about Jellystone Park™. Email Blasts – We send monthly e-newsletters to a list of over 70,000 subscribers looking for information about our parks. Blogger Outreach – LSI works with several popular travel bloggers and looks to expand our blogging network as authentic content and testimonials become ever more important to our business. Gift Card Program – Launched in 2015, our gift card program’s goal is to expand sales for both your store and sites/rentals. In addition, our partnership with Great Lakes Scrip – a school fundraising company – enhances the program by bringing our brand to families and schools across the country. Guest Research Survey – Conducted annually by a third party vendor, our guest research survey provides detailed feedback on the guest experience to help you improve your business. Results can be viewed in real-time online throughout the summer so adjustments can be made quickly. In addition, franchisees receive a comprehensive report in the fall that provides benchmarking data, identifies areas needing improvement, measures satisfaction, and captures guest comments. Our research vendor, SureVista Solutions, is available for one-on-one consultation as well. Customer Care – A resource for both franchisees and guests when there is a guest complaint or issue. Our Customer Care department is operated by a hospitality consultant with 30 years in the campground industry. The goal of Customer Care is to turn a complaint into repeat business. Costumes – We have multiple Cindy Bear™, Boo Boo™ and Ranger Smith™ costumes for park use. Would you like to have Cindy Bear™ visit your park for Mother’s Day? Simply request the date and the costume will be shipped to you. Tradeshow Stanchions & Bags – Tradeshow stanchions are available for park use so you don’t have to invest in one yourself. In addition, we provide each location with free bags to use as giveaways. Graphic Design Services – We have a long-standing partnership with a professional graphic designer who can develop advertisements and other marketing collateral for your park. Texting Program –Drive incremental revenue to your store, snack shop or paid activities with our texting program. You control the messages and alert guests to special deals, event start times and other time-sensitive topics. The program increases guest satisfaction too because guests easily know what is happening around your park. Newsletter – A monthly franchisee newsletter keeps everyone informed about franchise news, trends, new vendors, tips and more. Yogi Bear™ & Friends Artwork and Photos – We have an online style guide available to parks and vendors that contains over 300 pieces of artwork and photos for marketing use.